Breeders Cup 2015 - Day two - Jen loves Clark! Now for the really big day - 9 championship races, culminating in the Breeders' Cup Classic featuring American Pharoah. Morning Line Favorite: Songbird at 7-5. Songbird has been absolutely brilliant on the West Coast, while Rachel's Valentina (daughter of the great Rachel Alexandra) has been solid on the East Coast. It's a two horse race IMO. Bet $5 Exacta 9 with 10 both ways. The race unfolded much as expected: Songbird went to the front and set sensible fractions. 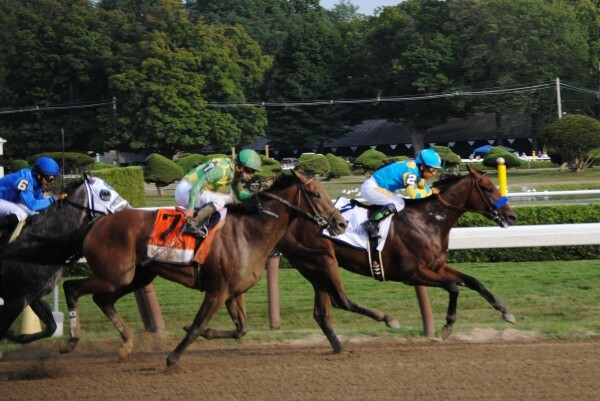 Rachel's Valentina settled mid pack and came charging, but wasn't able to close down the gap. Songbird will be unanimous selection for champion 2 year-old filly, but Rachel's Valentina is bred to get better with age. Here's looking forward to next year's racing between these two. Morning Line Favorite: Lady Shipman at 5-2. Bet against - this race is too wide open to take short odds. Was right to pick a longshot, but picked the wrong one. Ready for Rye and Mongolian Saturday went for the early lead, setting brisk but not suicidal fractions. Heading into the stretch, Mongolian Saturday struck the lead and opened up what looked like a commanding lead. But Lady Shipman proved dead game, whittling down that advantage with every stride. The wire came just in time for Mongolian Saturday as he won by a nose. Great race! Morning Line Favorite: Cavorting at 3-1. Bet against. The main question here IMO is whether the brilliant La Verdad can hold her speed for 7 furlongs. At 6 1/2 furlongs and less, she has a 6 game win streak with consistent triple digit Beyers. But that extra half furlong can be cruel for a front-runner, even as it will help the deep closers. I'll cross my fingers and hope. As expected, La Verdad (a well named mare by Yes Its True who in turn is by Is It True) went to the lead and played catch me if you can. All the way down the very long Keeneland stretch she held her advantage. But from deep in the pack, Wavell Station came charging, passing the rest of the field with authority. In the final few strides, the distance told on La Verdad and she gave way. Morning Line Favorite: Legatissimo at 8-5 (bet down to 4-5 at post time). Undeniably the best in the field, but is she worth the short price? Or should I pick a longshot for place? Secret Gesture went to the lead and set a typical (slow) turf pace. Coming into the stretch, the first group all looked to have a chance. Stephanie's Kitten rode the rail and weaved her way through a hole, then charged to the lead. Legatissimo angled wide and was closing, but lacked her normal turn of foot on the yielding turf. Stephanie's Kitten wins! Morning Line Favorite: Private Zone at 5-2. Features two fantastic sprinters, Private Zone and Runhappy. The latter has been more brilliant this year, but Private Zone has the advantage of experience. My only fear is that they'll burn each other out, setting up the race for a closer. Holy Boss and Private Zone battled for the early lead, with Private Zone opening up at the top of the stretch. Edgar Prado got Runhappy to settle just off the pace, angled him wide and let him do his thing - Runhappy runs fast! For a while it looked like Private Zone's lead would hold up but then Runhappy hit his best stride and blew past to win by over a length. New track record of 1:08.58. What a horse. So happy for his trainer, Maria Borel! 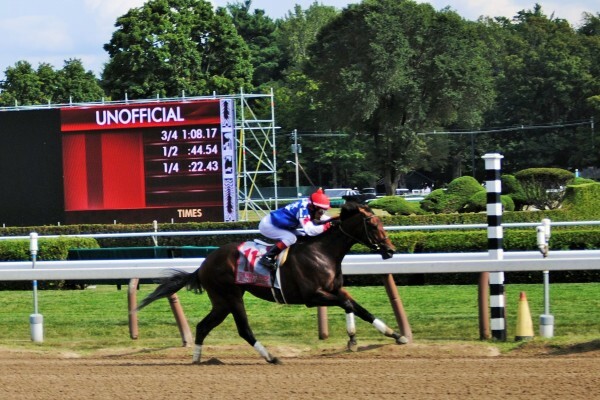 Runhappy winning the King's Bishop at Saratoga this summer. Morning Line Favorite: Make Believe at 3-1. The best European miler elected to run in the Classic, so this race is wide open. Looking for a live longshot, keeping in mind the turf still has a fair bit of give to it. Obviously led them around at a respectable pace with Tepin on his shoulder. At the top of the stretch, Tepin opened up and there was no catching her. A few horses came running late but they were only looking for second. The top 3 were all at double digit odds as the European horses just didn't fire. Bad omen for Golden Horn? We'll see. Congratulations to Mark Casse, now with 2 Breeders' Cup wins after going 0-25 in previous years. Morning Line Favorite: Brody's Cause at 7-2. He's favoured because he beat Exaggerator in Keeneland's major 2 year old prep. However, that was on a sloppy track with Exaggerator trapped on the rail. This time round, I expect Exaggerator to reverse the outcome. Of course, there's a lot of good colts in the field, and any one of them may take a sudden step forward. Morning Line Favorite: Golden Horn at 4-5. The best turf horse in the world, having won the Derby and Arc de Triomphe. But no horse has ever completed the Arc-Turf double - its very hard to hold peak form over the intervening weeks, especially factoring in the travel and quarantine. The ground beat Golden Horn here - the turf is obviously considerably softer than expected. Shining Copper went off to an enormous lead even though the fractions were modest. Golden Horn made his move on the far turn and took over but then faced the long stretch drive home. Found, a talented filly who kept finding one horse to good, steadily ate into Golden Horn's lead and drew clear with 1/16th to go. Golden Horn fought all the way down the stretch and looked to be closing down the gap as they neared the wire, but it wasn't enough. Another great performance, even if the time was pedestrian. 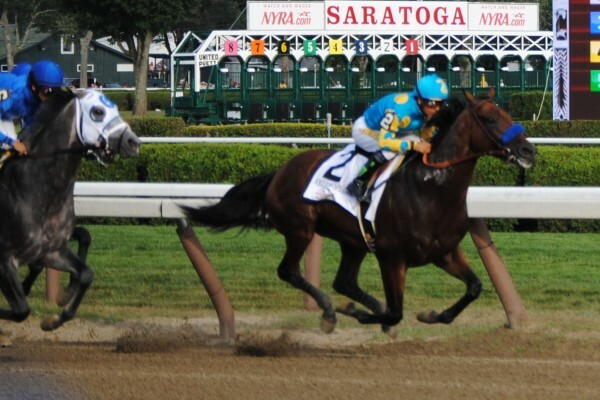 Morning Line Favorite: American Pharoah at 4-5. He's dominated the 3 year old division, despite a very game loss in the Travers at Saratoga. But can he handle older horses as well? Will the others let him get off to an early lead, or will they pressure him to get him off the game? He's been brilliant in training but is he race ready coming off a 9 week layoff? That's a lot of questions for an odds on favorite to answer, but I can't bet against him. Chills baby! I had my doubts but American Pharoah put them to rest early by getting an easy lead, and then galloping this top class field into the ground. Around the far turn he opened up and I knew he wasn't coming back to them. Just magnificent. Anyway all the pictures of the Pretty horses are so Pretty. Good to hear from you. Thank you. I keep meaning to post but inertia takes over. But today is what I laughingly call my high holy day, so I made the effort. And what a day of racing it turned out to be. American Pharoah had me in tears with his performance, and everyone came home safe. What more can you ask for!